The Vaal River is a class 2-3 river. It has a beautiful setting on the banks of Parys, which is an hour’s drive from Johannesburg. This is the ideal corporate venue as this is not a rough river but definitely a very scenic one. The rapids are mild in comparison with other larger rivers but very enjoyable. We guarantee that you and your group will have a lot of fun on this river. We call the Vaal Experience an introduction into rafting. As we said before it is mild and ideal for Teambuilding or first time rafters. For the international client it is ideal to Acclimatise before going on to the rest of your tour. It is a great African experience with 126 different bird species to admire and some of the most eautiful sunsets you have ever witnessed. Half-day rafting trip:You can either raft in the morning or in the afternoon for 7 km. If you want you can stay over at the numerous guest-housed or lodges on the banks of the Vaal and go shopping for antiques or art in Parys. 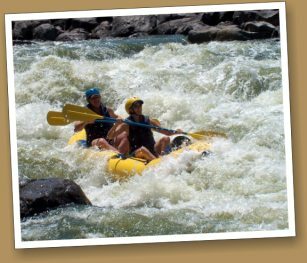 Full-day Rafting trip: This is a 14 km stretch of the river that we do and you will definitely go down one class 3 rapid in the day. This trip includes a lunch on the banks of the river. Packages and Combos: There are a variety of trips and combinations that you can choose from, for example a Half-day rafting trip with Abseiling and a conference OR Weekend Breakaway wit a list of activities OR a Teambuilding etc. We will tailor-make your package to suit you or your company’s individual needs. What is the minimum amount of people that we can accommodate? We can accommodate 1 to 100 people on the rafting, but can accommodate much more if we run two or three trips with a group. The venue is situated in the heart of Zululand on the banks of the Tugela River near Weenen. It is 4 hours away from Johannesburg and 2.5 hours from Durban. This is an experience not to be missed, as this is a fun filled adrenalin-rushing experience. 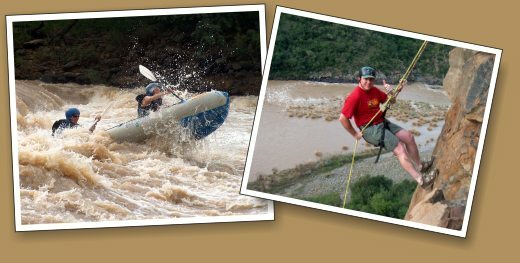 A rafting trip on the Tugela is more than just Rafting. You will experience a full-blown 4x4 drive to the venue as the lodge is totally inaccessible with a ormal vehicle. The tented lodge is situated on the banks of the Tugela, and provides the all the luxuries and necessities plus/all with a stunning view which guarantees a pleasant stay. 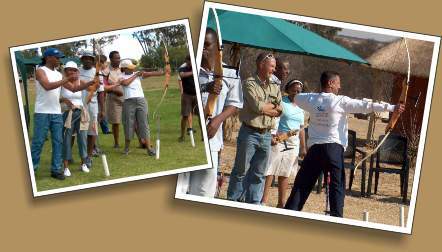 Your activities range from rafting and abseiling in the canyon, game walks, orienteering, fishing, “foefie slide” and many more. This river is rated class 3-5 and is sure to give you the trip of a lifetime. You will either use 10 man rafts for high water or 2 man rafts for lower water. The abseil is approximately 40 meters high But gives you the feeling of abseiling 100 meters plus as you descent into the canyon. The venue is ideal for the adventurer, but we have done very successful corporate team builds and other team interventions at this venue. Please contact us for more details and a quote on your tailor-made package. Other rivers will be on request only. We offer Kayaking courses and trips for the beginner and the more advanced Kayaker. There are many of these trips running every month, contact us to see on what river we are running and when. Abseiling is descending down a building or cliff or any man made or natural high structure with a rope and a friction device. This is an adrenalin rush even for the person who has done it before. The reason is that it is different every time. It is a very good tool in team building exercises as it shows the individual how far he can push himself or his team. You don’t have to be a corporate group to attend one of our Abseils, hit the contact us button to get more information on our abseiling. Our instructors are High Angle Rescue Instructors and are therefore highly experienced in this field. Come and experience one of the least known, but most exiting fishing spots in the country – namely on the Vaal river near Parys. This section of the Vaal is full of rapids and islands, where you can fish for Yellow Fish to your hearts content. If you have never caught a Yellow on a Fly you have not yet Fly Fished. Most of the places we fish in is only accessible with a boat, therefore you will not have 20 other anglers competing for the same fish as you. We like to keep our trips exclusive and small. Challenge your buddies to have it out and see who is the king of the jungle by declaring war on each other with paintball guns. There are many games to choose from, the one more exiting than the other. Corporate companies can make use of this as a Teambuilding exercise as you need to plan and strategise to outwit the other team and work together as one unit to be successful. The war stories go down well with a beer afterwards when all the stress is worked out of your system. This is the sport of kings and as old as the ages. Try your hand with the bow and see how difficult it was for our fore fathers to have made war or put food on the table with a Recurve or Long Bow. This might be just the thing to get you started in Archery or Bow Hunting. We work very closely with the Scorpion Off Road College; they are one of the most successful 4x4 driving operations in the country and in Africa. They have years of experience in this field. We can accommodate you at virtually any venue in the country. For a corporate event you might want to use it as a teambuilding exercise or a team incentive event, or it can just be an ideal opportunity to learn how to drive a 4x4 properly. We have numerous excursions that you can partake in. We also do trips to Botswana and other neighbouring countries in Southern Africa. Our team is one of the most professional Quad biking people. This can be one of the most exiting as well as one of the most dangerous activities that you can do, depending on how it is presented. We believe in safety first, and will do anything in our power to ensure that you have a fun filled activity without the tears. This is one of those activities that we can run at any venue due to the versatility of these machines. Navigation has always been a must through the ages. The early settlers and Sea Farers never left home without a compass. We set out a course with different waypoints that you and your team need to reach with the aide of a compass or a GPS (Global Positioning System) and a map. At each of these waypoints you need to complete a task, pick up an item or get a clue to your next waypoint. Orienteering provides ideal challenges for teambuilding and is therefore very popular with corporate groups. The tasks at each waypoint are then altered into specific teambuilding activities to address development areas in the team as identified with the client. This provides a platform for the team to work together, to solve the problems that they are faced with. This is an excellent activity for larger groups where we need to break them down into smaller groups and set them of in the field of play. This is a program not an activity. This program is for teams that want to get more out of their team and know how their team functions under pressure. We take the team into a remote area where there is very little possibility to run into other humans. We work on a scenario of a plane that crashed and the team is the only survivors. We play the scenario that the team needs to travel three days to get to civilisation, as it will take the rescue team four days to respond. We teach the team basic survival techniques and get them to solve the problems that they encounter during the three-day hike. We create certain problems that the team needs to overcome. We have a lot of talks to discuss the team’s behaviour with problems arising and also the normal run of the day problems that we encounter on route to our destination. We have a qualified person with the team at all times that will be able to deal with any psychological problems and behaviour that will arise from the activities and stress that can be encountered during the route. This is an activity for teams and not individuals. This is for teams that are in an advanced stage of their team dynamics and ready to take the next step team development. We do numerous excursions into neighbouring countries. You can do a self drive with us or to ensure that you do not get lost or go into places that you will not return from. Our team has plenty of experience and have spent many months driving through countries in Southern Africa by themselves or taking people out there. As you know it is not advisable to go into certain places in Africa by yourself, as you will emerge from this ordeal without your vehicle and with your pride in your pocket. Let us share our experience with you and join us on your next trip over the border. We believe in taking the route less travelled, which is more than often the more rewarding and exciting route to travel. This way you experience the real Africa and what it has to offer.